Captain Chuck Wigzell is the owner and operator of “Hooked Up Sportfishing” and the Captain of “Ez Pickens.” Chuck has been a very successful captain over the years in Kona. In 2008 and 2009 he tagged the most billfish in the Pacific Ocean using the NOAA tags. 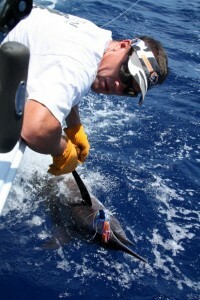 In 2012 he tagged the most spearfish in the Pacific using the Billfish Foundation tags. In addition Captain Chuck has placed in many tournaments over the years, check out “tournament” section on the webpage for more detailed tournament winnings and or book up one of the upcoming tournaments and get in on the fun! Chuck moved to Hawaii with his parents in 1986. 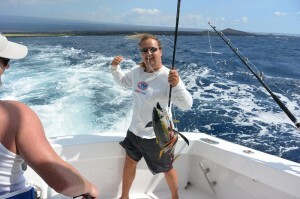 He started his fishing career out of Kona in 1992 during the summer months while he was going to college. He fished his dad’s 20′ boat, “Bad to the Bone,” with his brother Jim Wigzell, together they supplied their family restaurant (Pancho and Lefty’s Cantina & Restaurante’) with fresh fish. They hustled the restaurants customers and would take them fishing for gas money and actually did quite well and caught a lot of fish. This is how they got started in the fishing business. “My goal is to make sure you have the best fishing experience. I strive to run a first class, friendly, and affordable charter fishing service. I don’t forget who is paying for the boat… Customer Service and Professionalism is very important to me! You are paying for the charter and you deserve to have a good time. If for some reason I have to cancel your trip due to bad weather or mechanical problems or for any other reason I will refund 100% of your money. I truly look forward to taking you fishing”. Captain Rocky has been fishing with Captain Chuck since 2008. Every December through March Capt. Rocky escapes the cold winters in New Hampshire and joins Capt. Chuck working as either captain or crew for both the “Hooked Up” or “EZ Pickens.” Together they have showed success, landing a 975lb Blue Marlin and winning a Tournament with an 886lb Blue Marlin. 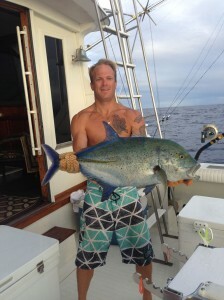 Ulua Matt crews on both the “Hooked Up” and “EZ Pickens” with Captain Chuck. Born on Oahu and raised on the Big Island of Hawaii, Matt is an all around island boy. 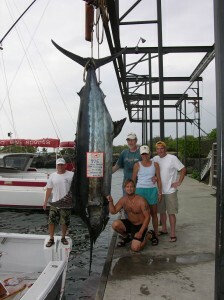 He is very experienced in all the fisheries of the islands, especially shore line fishing. When he was 12 years old he caught his first Trevally (Ulua in Hawaiian) and ever since has became one of the better fisherman on the island that catch these Giant Trevally that roam our reefs and shore lines. This is how he earned his name “Ulua Matt.” He is very knowledgeable about the island and pretty much knows and has fished every nook and cranny for these giant Ulua. Matt is also a certified dive master and takes people out scuba diving, nighttime Manta Ray Snorkeling and Dolphin Excursions. He someday wants to start his own tour company, where he will guide and share his knowledge of the Big Island.